Does it matter if your twin is a male or a female? The results are surprising. (NEW YORK) — Does it matter if your twin is a male or a female? Maybe. Researchers from the Norwegian School of Economics, Northwestern University and Emory University looked at what happens if a female shares a womb with a male twin. They found that 30 years or more after birth, there were significant educational and social disparities when comparing females with male twins to females with female twins. Females who shared the womb with a male had higher high school and college dropout rates, were less likely to get married, had fewer children, were less likely to be working and earned less in the workforce. Researchers used national registries in Norway to study over 13,000 twin births between 1967 and 1978. 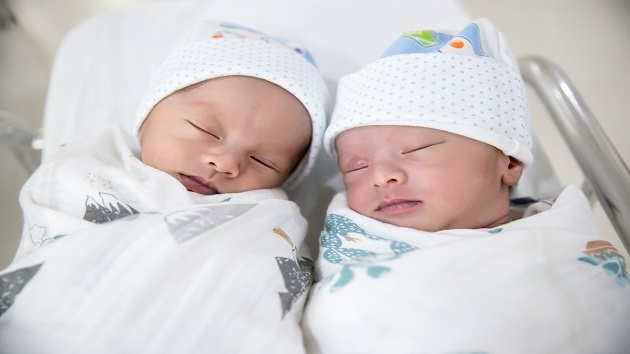 The rate of twin births has increased in the U.S., from 18.9 per 1,000 births in 1980 to 33.4 per 1,000 births in 2016, according to the Centers for Disease Control and Prevention. Based on data from Florida gathered between 1992 and 2002, the researchers estimate that in the U.S., the percentage newborn females with a male twin rose from 0.6 percent of total births in 1971 to 1.1 percent in 2010. Researchers believe their findings for female twins with a male counterpart are due to effects while in the womb (prenatal), rather than the social effects of growing up with a brother (postnatal). In order to control for postnatal environmental effects, researchers looked at group of female twins whose brothers died during their first year of life. The researchers concluded that the likely culprit is elevated testosterone that female twins are exposed to in the womb, though they do not have any testosterone-specific data to prove this. “Although we can nail down that this is a prenatal versus postnatal effect, the exact channel of this prenatal effect is unclear,” said Dr. Karbownik. He noted that based on prior studies, changes in morphology, physiology or behavior could be the cause of the long-term effects they saw in female twins. It is important to keep in mind that this study only looked at a group of patients in Norway, so we can’t assume the same results for the North American population. It also only examined a few metrics of long-term outcomes — perhaps female twins with male twin brothers excel in other areas of life that were not studied. Dr. Karbownik emphasized that “gender norms” is something that is constantly changing and evolving. It could be the case that if we looked at the data 20 years down, we may see no effect at all.